More than 100 senior leaders from international business, the public sector and UN agencies, civil society, and other interests attended the kick-off event of the CEO Water Mandate’s three days of activities taking place as part of World Water Week 2014. “This event provided another opportunity for the CEO Water Mandate to advance discussions and actions in relation to the crucial Post-2015 agenda – and we are most pleased to be giving special attention to global sanitation challenges”, said Gavin Power, Deputy Director of the UN Global Compact. “Sanitation is the most lagging of the Millennium Development Goals, and urgent action and coordination will be needed in the coming years and decades”. Adequate sanitation coverage is a vital component of sustainable development and poverty alleviation in the 21st century. 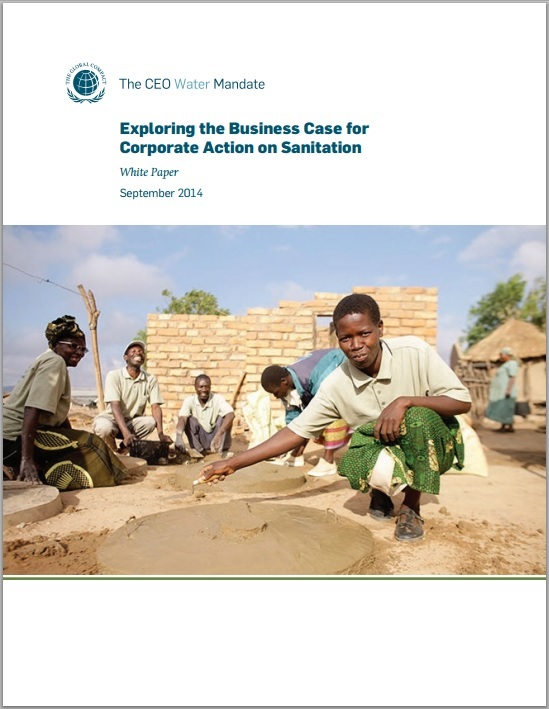 The CEO Water Mandate released a study – with a supporting foreword by the UN Deputy Secretary-General – that makes the case that action on sanitation is a moral imperative for companies around the world, and shows the business risks from lack of sanitation, as well as the opportunities and benefits offered by sanitation interventions. The study – Exploring the Business Case for Corporate Action on Sanitation – points out that the health impacts and contamination of ecosystems by human waste worldwide is one of the most significant contributors to infant and maternal mortality, poor economic growth, and lack of opportunity, especially for women. The situation is critical: every year half a million children still die from diarrhea caused by unsafe water and poor sanitation, and the world will miss the Millennium Development Goal of halving by 2015 the proportion of the population without sustainable access to sanitation by more than half a billion people. “Articulating the business case for action on sanitation is essential in showing companies why and how they can contribute to those global development efforts, and in the process strengthen their business”, said lead author Peter Schulte of the Pacific Institute, which serves as co-secretariat of the CEO Water Mandate. In addition to the sanitation study, the CEO Water Mandate conference also featured discussions on the business respect for the human right to water and sanitation, and corporate water disclosure.